Sounds like an OK idea. You would probably need to put a rectifier diode between the external pulse generator and the CD capacitor. If the output of the pulse generator is isolated you could use a bridge rectifier which would give full wave rectification and twice the capacitor charging speed. A low frequency rectifier would not be suitable. You would need a high speed diode. You may also need to put a resistor between the pulse generator output and the CD capacitor so as not to upset the pulse generator when the CD ignition fires. One thing you can check is the CD capacitor; these have a hard life and are prone to degrade. Changing the capacitor to a high voltage, high current polycarbonate type could solve your starting problems. The other capacitor that can degrade is the capacitor across the ignition coil primary. If this fails open circuit the spark duration, and thus energy, will be reduced radically. Yes i agree on degradation of cap;i wanted to ask about the value of resistance that can be attached between capacitor & pulse source. I would think that 22 Ohms 5W wirewound would do the job. Wirewound is good because it has some inductance. What can be done if the ac cdi already includes a low frequency rectifier...should i attach an additional hi frequency rectifier externally..if yes what would be specs of diode to be used. Good point: a 2 Amp minimum, 600V minimum rectifier would be a good choice. The voltage rating is on the high side to be safe. Put a 300V, minimum, 220nF, approximately, polycarbonate capacitor after the high speed rectifier and before the wire wound resistor. do i need to enhance or boost timing signal from pulsar coil? Afraid I do not know without a schematic of the pulsar circuit, but I think it is unlikely. One question: did the bike start OK at one time? starting needs several kicks (6-10) b ut once it starts,it runs ok.
That sounds like a weak mixture rather than electronics. Is the choke working OK? Is the carb set up correctly, especially float level? Have you got the correct plug gaps? Are the HT leads OK.
Are all the leads etc perfectly clean? What is the battery voltage when the engine is not running? yes sir, all of them are perfect in condition..on visual inspection i found the spark to be weaker...i even planned to rewind the exitor coil..in order to get better voltage hence better sparks...but dont know why the inductance of newly wound coil came out to be 0.5H instead of 1.3H which i expected even after more no of turns of magnet wire..(i used 38awg). 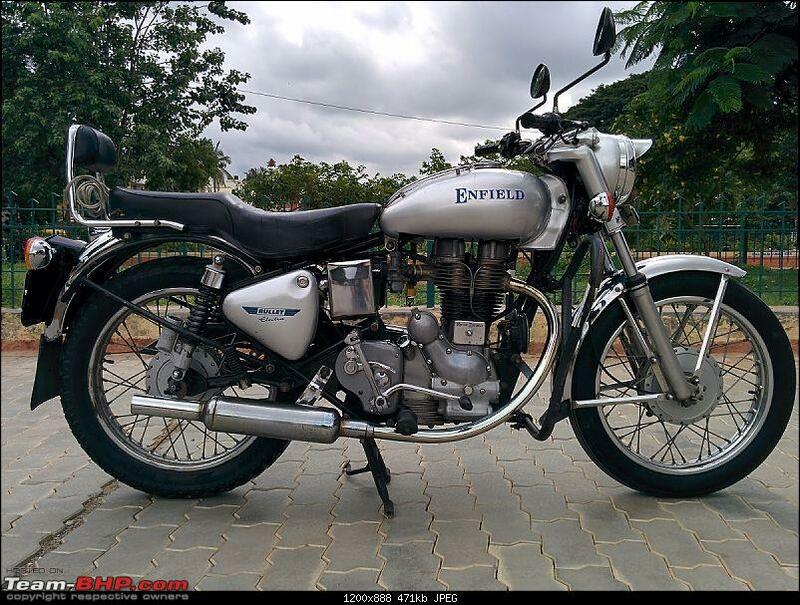 Is your bike a 350cc Madras (Bullet)? yes..it is 2002 model royal enfield electra cdi...i have installed a heavier crank for better thump n feel..
i would measure the voltage made in exitor coil while bike engine is at 1500-2000rpm (probably 90-120v ac;low frequency) & limit the output 30khz squarewave ac to corresponding voltage..
My aim is to start the bike in a kick or 2..
i hope 120v in would give a better spark even when the bike is running at 60km/hr..
any piece of advice spec? The symptoms you describe are baffling. I can't understand the low inductance reading with more turns. Presumably there is a core in the coil. Is the core cracked or not clamped together well ? substituting another 120V power supply sounds like a good move.